For the past week or so I have been obsessed with anti-inflammatory foods. It was all triggered by this blog post of fellow Dubai food blogger Ruth about an anti-inflammatory diet. Inflammation is the first response of the immune system to infection or irritation. The usual signs of inflammation (swelling, redness, pain) occur when we hurt ourselves or have some kind of infection. Eating the wrong foods can cause and/or aggravate inflammation within our bodies. While short-lived acute inflammation is crucial to keep us alive (e.g. after a bruise or cut), chronic inflammation that persists for a long period can kill us slowly over time. When low doses of pro-inflammatory substances continue to be released into the body for an extended period, they attack healthy cells, blood vessels and tissues instead of protecting them. These attacks may not always trigger pain and are nowhere to be seen, unlike a bruise or a cut sustained to the skin. Chronic inflammation is being regarded as one of the underlying causes for diseases like Diabetes Type 2, heart disease, stroke, cancer, Alzheimer, dementia, inflammatory bowel diseases and diseases with unknown causes such as allergies or migraines. Now what can cause chronic inflammation? Apart from mental stress, lack of sleep, environmental toxins and microorganisms (e.g. viruses and bacteria) it is food and food allergies. In imbalance of intake of Omega 3 (the good ones) and Omega 6 (the bad ones) fatty acids, a diet high in insulin-spiking foods (such as refined flours and sugars) cause the body to react with the production of pro-inflammatory hormones. Interestingly, foods that are otherwise considered very healthy are on the inflammatory side of the scale, especially grains (including whole grains), but also beans and lentils, and probably more obvious due to their sugar content, most fruits. With regards to the grains, I agree with it. I enjoy a mostly gluten free diet, but I actually try and avoid most grains if possible or have very little, as they leave me sluggish, full and bloated. I am still researching this issue. A very good book to read is The Inflammation-Free Diet Plan by Monica Reinagel. For the first time in my life, I kept a food journal for three days. I wanted to know if my diet is actually inflammatory or not. I figured out quite quickly, which foods will get me onto the positive side of the scale. And a few of the foods that I considered healthy brought the sum down by quite a bit. This salad definitely helped me to keep the sum on the upper side. 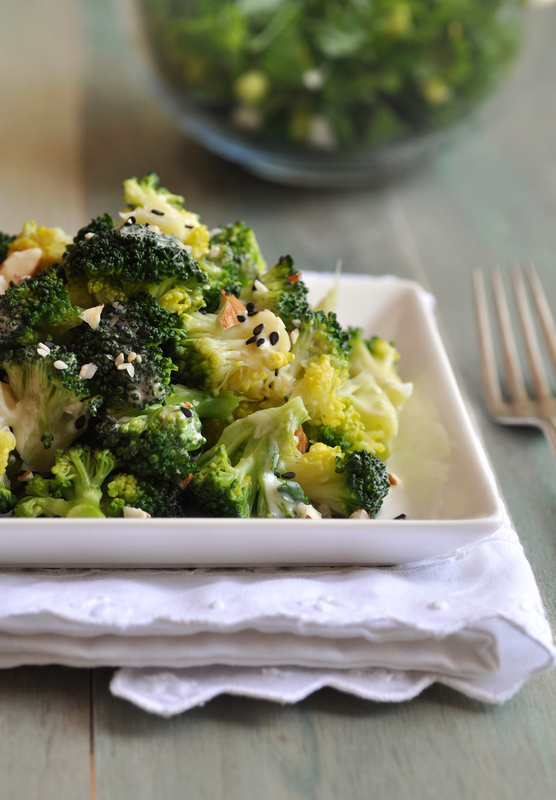 It's not only the broccoli, but also the almonds (more than other nuts), the olive oil and the garlic that make this salad an anti-inflammatory delicious lunch or side dish. I hope I got you interested in this topic. I am all over it as it makes sense in so many ways. Will keep on researching and hopefully will be able to tell you more about it very soon. In a dry skillet over medium low heat, toast the almonds until fragrant, about 5 minutes. Shake the pan regularly while toasting to avoid burning on one side. Take off the heat and let cool. Chop and set aside. Steam the broccoli florets for a few minutes, until barely tender. Turn them into a bowl of ice-cold water to stop the cooking process. Drain and set aside. In a small pan, whisk together tahini, olive oil, salt and garlic (if chosen). Whisk in hot water little by little to reach the desired consistency. I like mine similar to the consistency of mayonnaise. Transfer broccoli to serving bowl. Gently stir in the tahini dressing. Sprinkle with sesame seeds and chopped almonds. Best served at room temperature or cold.